When I was a teenager I played tennis…a LOT of tennis. My tennis matches against players at about my level were notoriously long as were the points that made up the matches. At some point some coach some where told me that the last person who hits the ball back (and gets it in) wins. As obvious as that sounds, I took this principle very, very seriously. I may not over power you on the court…but I WILL out play you. It was my mission to do one thing: get the ball back. Now that I am a parent I think it was really my mother and father who had nerves of steel and the patience of Job, not me. My matches would sometimes last three hours or more in the hot sun…and there they would be…watching on the sidelines, enduring each and every point. Each point was important and you were responsible for every play. You know that saying “there is no ‘I’ in team”? Well, in tennis there IS an “I”, there is NO team and (with the exception of doubles), it really is just me and myself. Make a mistake? No one to look at beside yourself. Those people on the sidelines? You aren’t imagining it. They really are staring at YOU…wondering…will YOU pull it together? There were times when I was down in the LAST set 1-5, 15-40. That means the other person had three chances in a row to win the entire match…and some how, some way…point by point…I just got the ball back. There is so much pressure on each point, but you have to figure out how to manage it…this pressure. If you get too anxious you will likely make an unforced error. If you forget how much the point is worth you will get lazy and not get to the ball. I used positive self-talk a lot, but I had something else I did on a regular basis to help me overcome heightened anxiety. I would sing inside my head (not out loud…good grief…thank God for that). I would swing at a ball and find the rhythm of a hymn I had heard since childhood. Over and over I would sing the words to some well-known song of faith in my head. The words and the rhythm, interspersed with some positive self-talk, would keep my heart and mind calm, focused. Then, point by point, game by game…match. A tennis match is a PROCESS…it is more marathon than sprint. There is no “quick” win. There is only winning point by point, game by game…match. In the hot sun. A friend who is an educator by profession recently introduced me to two fascinating concepts. These concepts are “grit”, as researched by Angela Duckworth, and “growth mindset”, as researched by Carol Dweck. “Grit” is that special quality over and beyond intelligence…in fact, entirely SEPARATE from intelligence…that makes a person succeed. It is tenacity and a willingness to keep working hard…for a LONG time and in the face of MANY obstacles to get to a destination. “Growth mindset”, as opposed to “fixed mindset”, is the idea that individuals who see success at any goal as a PROCESS rather than a fixed identity or destination are more likely to succeed in the long run. Having a growth mindset is tolerating failure as a chance to learn and grow. It is prizing growth and challenge over perfection. I’m going to be honest. I like to think I’ve been pretty “gritty” in my life, but I think somewhere along the way in the last little while I lost some of my grittiness. I got to a place where the process seemed just too exhausting. I wanted the sprint. I was tired of marathons. I didn’t want to get the ball back just one more time. Maybe it had to do with being exhausted from keeping up with four kids. Maybe it was being exposed to some negative voices on my journey. In the past weeks I found myself faced with a marathon task. This is going to be a PROCESS. Three hour match in the hot sun. No quick wins here. I must either figure out where to find my “grit” and a mindset of growth…or I will FAIL. Period. I was feeling like I was down 1-5, 15-40 in the last set. I started feeling anxious…overwhelmed by the pressure. I know myself well enough to know that this is not a good place for me. I MUST find the “zone”…enough pressure to keep me on task, but not so much pressure I make an unforced error…or worse, quit. Then I heard myself. It happened so instinctively. I started singing. Those familiar old words. Songs I have heard thousands of times. And, I started working. I made a plan. I began to strategize…for the PROCESS…a marathon…a three hour match in the hot sun. I’m thinking about all of this when I realize that there is no such thing as a sprint…not for anything of value anyway. Parenting? Three hour match in the hot sun…with everyone watching. NOT a moment, not a sprint, not a journey without failures and growth. Our faith journey is a three hour match in the hot sun…with a Father on the sidelines who has the patience of Job…who GAVE the patience TO Job….knowing our matches are going to be long and grueling…and that we might sometimes lose. 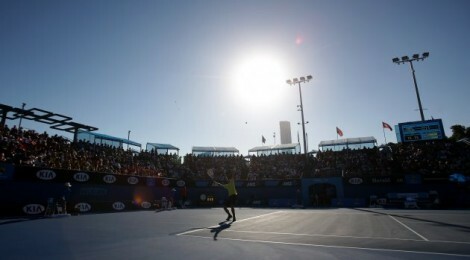 Still…He stands…in the hot sun…enduring each and every point. And the truth? I PROMISE you…I HAVE been down 1-5, 15-40 in the last set. I have been THIS close to losing completely in life. Then, some how, some WAY…I started getting the ball back over…just one more time. As ludicrous as I KNOW it is (probably even more ludicrous to my family who gets to hear me sing all the time! ), He loves to hear me sing. Friend. He loves to hear YOU sing. He LOVES to see you play in the “zone”…with a growth mindset…marathon ready…prepared to lose points…and try again. He wants you to learn how to marathon…not just sprint. He wants you to have GRIT…in every area of your life. He wants you to KEEP GOING. This is a marathon. This is a 3 hour match in the hot sun and sometimes it can seem like EVERYONE is watching. It doesn’t matter. You’ve just got to get that ball back over. You HAVE to. Even if you lose this point. Because there is another one. And another one. And another one. You’ve got to take a deep breath and learn from all those points you lost…and then start SINGING. You have got to get your focus…play in the ZONE…with enough pressure to keep you on task…but not so much pressure that your fear of mistakes makes you quit. I promise He is on the sidelines. In the hot sun. With the patience of Job for every point you lose…because He knows. He knows that this is no sprint. This is no moment in time. This is no journey without failures and growth. He knows that this life thing, this faith journey, this walk with Him and with others…it is a MARATHON. PROCESS. Three hour match in the hot sun. I also know He loves to hear you sing. You might have something else. Find it. Do it. And when you are down 1-5, 15-40 in the last set start doing it…whatever it takes that helps you overcome any performance anxiety so that you have just the right balance…enough pressure to keep on task, but not so much pressure that you quit. Because He LOVES to hear you sing…and He LOVES to watch you play. Congratulations, Emily, on a great post and finding your song. Thank you for sharing. Thanks, Heather…for reading and for your encouragement.